PREHEAT oven to 350F. Grease 24 mini-muffin cups. Place one square of cookie dough into each cup. BAKE for 15 to 17 minutes or until golden brown. Cool completely in pan on wire rack. With tip of butter knife, remove cookie cups from muffin pan(s). SPOON half of frosting into plastic bag; seal. Stir food coloring into remaining frosting in container until desired color is reached. Fill other plastic bag with colored frosting; seal. Cut 1/2-inch from corner of each bag. 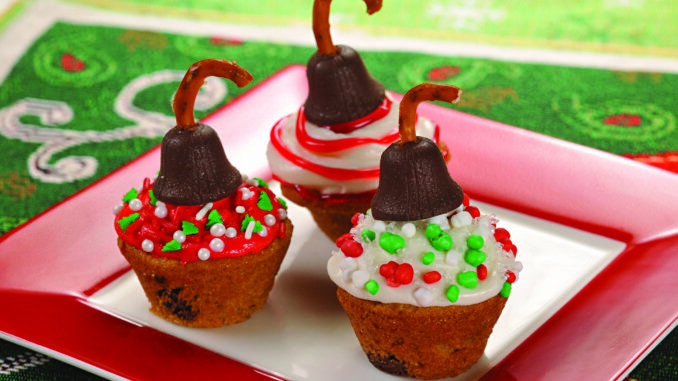 Squeeze bags lightly to pipe frosting on top of each cookie cup to form rounded ornament shape. Decorate with sprinkles, sugars and/or gels. Place a chocolate bell candy on top of each. To adhere hook, use a small amount of icing.